Fun fact: I've never seen a whole episode of the Dr. Oz Show. Yes, I'm a fitness professional and, nope, never made it past the first two minutes of any episode. I don't know what it is about the show that makes it so obnoxious to me that I can't train my focus on it for more than 120 seconds. Is it because Dr. Oz seems like he's high on life (or some other substance)? Is it because the set looks like Oprah meets the Price is Right? Is it because the audience looks like they've been paid to be there? Or is it because Dr. Oz can't decide whether he wants to wear scrubs or a suit? Who knows. Anyway, last night I did the impossible--I made it through an entire segment of Dr. Oz. Okay, so not a whole episode, but close enough. The segment was called, "The Seven Day Miracle Plan." Being the conscientious engaged-gal that I am, I tuned in. The info wasn't revolutionary. BUT, it was a good reminder as I'm in my quest to drop some body fat before the big wedding day next year. Here's all three parts of the episode. I went back and I actually WATCHED ALL THREE! :) I still think Dr. Oz is a little over the top for me, but I did enjoy the reminders of ways to rev the ol' metabolism. 1. Cut 100 calories a day--a smarter way to cut calories gradually without slowing the body's metabolism furnace. When you deprive yourself of too much food, your body goes "WHAT THE HELL! I'm HAAAANGRY!" and goes into starvation mode by slowing the metabolism. 2. Eat every three hours--keep that metabolism furnace going by eating a small meal or snack (about 200-350 calories) every 3-4 hours. Your metabolism is like a fire, gotta keep feeding it good, nutritious food to keep the fire burning! 3. Drink ice-cold drinks--Your body has to warm up that liquid after it enters the body and it does so by burning energy. It's debatable effective this actually is, but it can't hurt to drink more ice-cold WATER! I drink a cold glass first thing in the AM and right before bed. 4. Take Zinc--I'm a firm believer in vitamins and supplements. At the very least, take a good multi-vitamin to ensure that your body is meeting all of it's nutrient needs. 5. Exercise in bursts--all day, everyday. Little bursts--like jogging up the stairs or doing jumping jacks during a TV commercial break--is way better than doing nothing at all. It makes your metabolism go "OH! Time to get this fire going again!" Right now I'm all about HIIT (High Intensity Interval Training), which is based around this principle. Shorter bursts at higher intensity to burn more fat and rev up the metabolism over the same amount of time as traditional cardio. 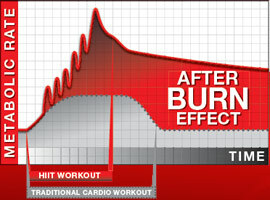 A diagram of HIIT calorie burn vs. traditional cardio. Let me know if any of these tips work for you! Q.O.D. 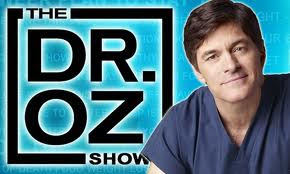 (Question of the day): Do you watch the Dr. Oz Show? What are your tried-and-true metabolism boosters?